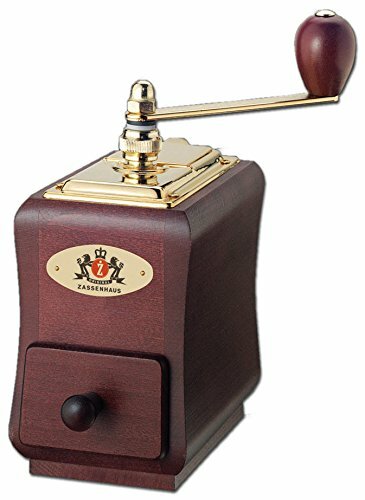 The Matte Copper Adjustable Manual Coffee Grinder from Clever Chef is a style of coffee grinder in an old-world style with copper and wood that we really appreciate. When coffee grinders aren’t being used, they should add visual appeal to your kitchen, and we believe this grinder fits with many kitchen styles. While that’s not the most important part of the reason to choose a grinder, it should be one of the considerations. The container to capture the grinds underneath is made of a clear glass, which allows you to see exactly how the grinder is performing. It also gives you more immediate storage for making a pot of coffee. This container has the capacity to hold more grinds that some other manual grinders. If you want a single cup of coffee, we recommend that you only add the perfect amount of beans to the hopper unless you plan on purchasing a coffee vault to hold the leftover grinds. Grinding and leaving them defeats the purpose of grinding fresh beans. 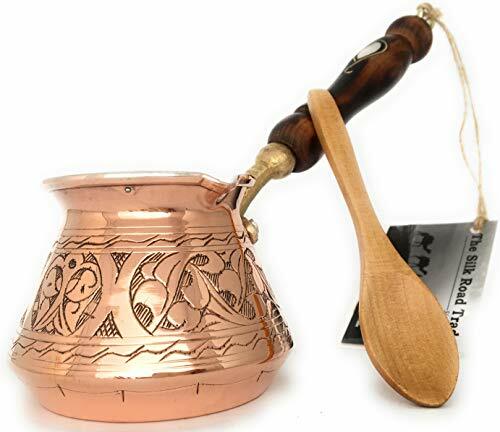 The container measures 9 x 6 x 3 inches and can hold 2.5 cups of grind. To adjust the grind size, you’ll need to unscrew the nut from the handle on the assembly. Take the handle from the grinder as well as the locking key, which has 3 prongs. What remains is a 6-prong nut that will be used for adjustment. This is how you adjust the distance between the burr and grinder. If you spin it to the left, the grind will be coarse. Spin it to the right for finer grinds. You’ll need to experiment when you first receive the grinder. Once it’s adjusted appropriately, replace the 3-prong locking key and the handle. While we never recommend using this for spices, it can certainly fulfill that purpose. 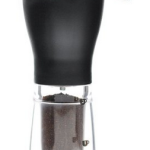 When you want to grind allspice, peppercorns, mustard seeds, or coriander seeds, this grinder will do the trick. With the ceramic burrs, you can wash the grinder out and hope you’ve removed all the mustard seed dust. Otherwise, you’ll end up with mustard coffee the next day. Don’t say we didn’t warn you! As we’ve discussed previously, the ceramic burr is one of the best manual burrs you can use to make a uniform grind that will result in a delicious cup of coffee. The ceramic nature of the burr means that you don’t have to worry about rust when you’re washing out the grinder. While some other stainless steel constructed units require a tiny brush to clean out the unit, this one doesn’t. Ceramic will never rust. 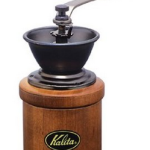 The materials used for this manual grinder are high quality from the shatter-resistance glass container to the durable ceramic burrs to the copper and wood handle and hopper design. This grinder should hold up well over time, and you won’t have to handle this with care as you grind your beans in the morning. With dozens of turns per hopper of beans, there are some mornings you might want to rush through the process. You can easily crank out fast grind in the morning before a busy day at work. We wanted to take a moment to remember why we love to grind coffee at home. It’s the freshest coffee you’re going to get unless you live in a field of beans and can pick and roast your own. You’ll still grind them after the picking and roasting. Manual grinding will keep the grind uniform, which is vital for a good cup of coffee. With some coarse and some fine, the resulting coffee will be over-extracted or under-extracted. There’s some discrepancy among purchasers of the Matte Copper Adjustable Manual Coffee Grinder regarding how to adjust the grind. Since it doesn’t come with directions, it can be difficult to know where the adjustment knob is located. There are detailed instructions above as well as a note from Clever Chef. If you’re not happy with the grinder, the manufacturer offers a 100 percent satisfaction guarantee for one year. We always love when manufacturers stand behind their product with a warranty. Whether we are iffy about the construction and longevity of the grinder or not, a guarantee instantly makes us feel as if the grinder is a good choice. 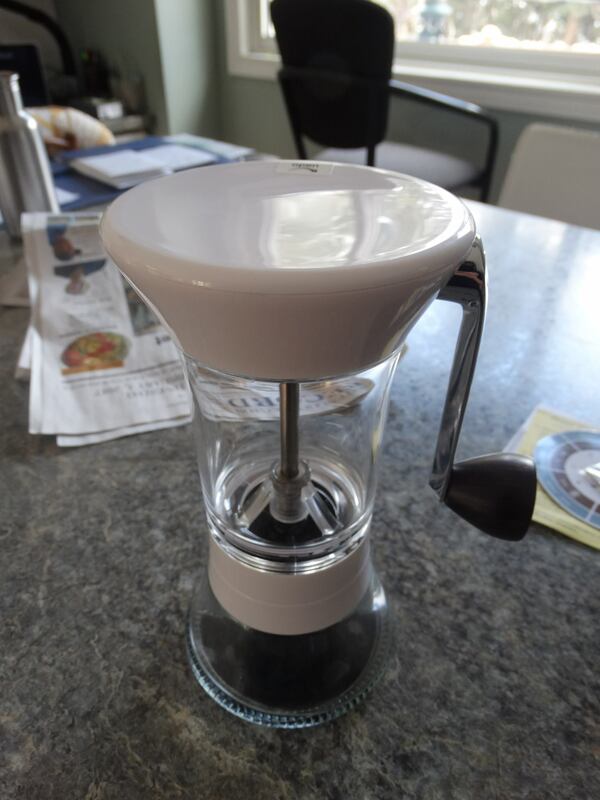 That’s our review of the Matte Copper Adjustable Manual Coffee Grinder. 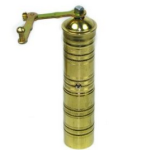 If you love a vintage-inspired grinder with the shine of copper, this is a great grinder for your counter. It’ll be sitting on the counter more often than you’ll be using it, so that should always be a consideration when purchasing. Aside from the aesthetics of the grinder, it’s easy to adjust once you learn how, and the glass container can hold a moderate amount of grinds. On the weekends, this means you’ll have grinds for an entire day worth of coffee!